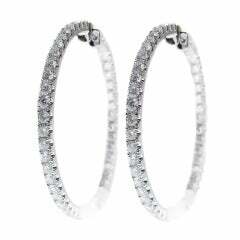 These stunning diamond hoops have diamonds set inside and out to give the piece symmetry and sparkle from all angles. There are 124 Round Cut Diamonds that weigh 1.07 carats and they are made in 14K White Gold and weigh approximately 6.8 grams. The length of the hoops are 1.5 inches and there is a special lock to the earrings that will ensure extra protection.